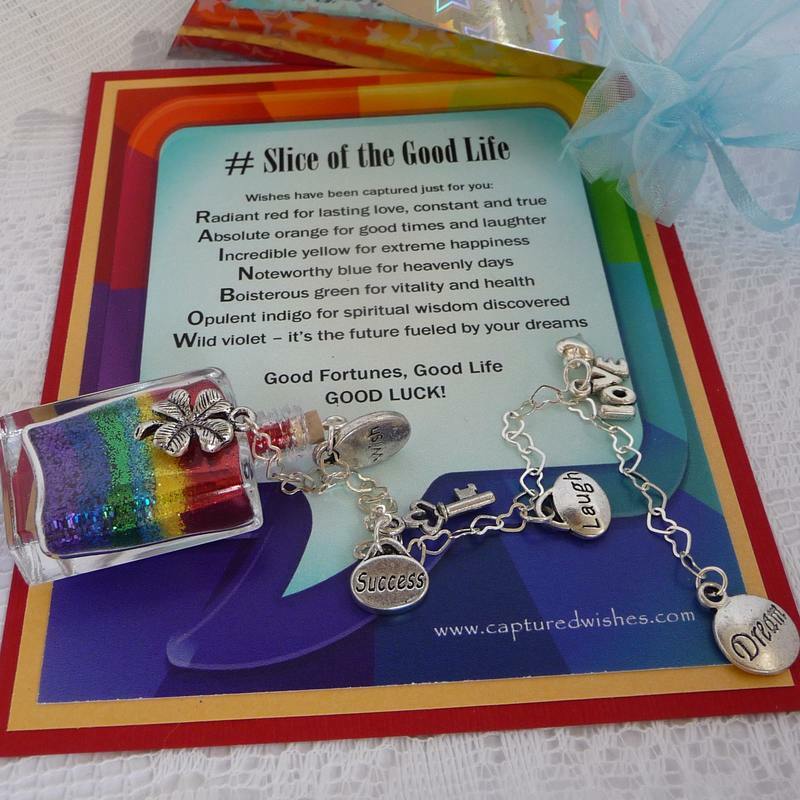 If somebody special needs a good luck slice of life, then Captured Wishes has the answer! This Good Luck Wish vessel is suitable for any occasion, any venture and any challenge that your friend, colleague or family member needs good fortune to face. The hashtag sums this up nicely. Just as texting and tweeting are their own technological phenomenons, what would a slice of rainbow actually look like if it were captured? Give someone their own piece of optical phenomenon. A Rainbow symbolizes success at the major thresholds of life where there are impossibly perfect conditions where everyone's happy and nothing goes wrong. Who wouldn't want to wish that? Each Captured Wish Slice of Life vessel comes in beautiful custom packaging with a lovely verse card which puts the thoughts and emotions you have trouble expressing into words for you. Your loved one will adore the gesture even more so with the delicate Captured Wish vessel filled with layers of Fairy Dust and shiny charms. The Wish vessel measures 40mm height by 26mm width. It contains carefully layered Fairy Dust, all identified for the good fortune your recipient needs to succeed in their future endeavors. This wish vessel could be given for any occasion, that major life moment where nothing but favorable outcomes are hoped for in whatever new venture or path someone decides to take.